Our latest, page 219, shows the Electric Team and friends walking through the forest, in search of the hidden Nazi hideout. Sam draws a great forest, doesn’t she? Over on our Patreon page, I asked what sorts of stuff people would like to see, both on this blog and in our Patreon-exclusive content. One of our patrons said she was interested in behind-the-scenes, process kind of stuff, so I have decided to write about the process behind our most recent page, in possibly mind-numbing detail. Let’s see how it goes! Let’s start with the macro-level. We divide the story of the Electric Team into chapters, and then print each chapter as an issue of the comic. I shoot for 24 pages for each issue, though we usually run long; issues 2 and 6 were the only ones to actually end up being 24 pages. Still, page count is always a factor. I can’t afford to waste a lot of time on any given scene, I can’t let conversations run on and on. Everything has to justify taking up space. With the first issue of The Electric Team, I wrote the script before I had even found an artist. There was plenty of time to read over it, revise it, and talk about it with Sam. Since we started serializing the story online, though, I don’t tend to work too far ahead, and write the script in chunks, sometimes a page at a time. While I know where each chapter is going to end, and have a rough idea of how we’ll get there, there’s lots of room for improvisation along the way. That’s part of the fun, keeping things spontaneous and organic. Our current story is going to end up being printed as issue #8. I’ve known what the last page is going to be since we started this chapter; in fact, I’ve had that last page in mind for years. It’s an important moment, hopefully very emotional. I know our end point, and the challenge is getting there in the allotted space. Another factor is, since we’re serializing this, each page needs to be a unit of entertainment in its own right. This is particularly true since we cut back from two pages a week to one; now, that one page is all the reader is going to see for a week, so it should be satisfying. With those considerations in mind, I planned out the previous page, page 218, three or four times, cutting as much as I could, continually condensing it. There was originally going to be a longer argument between Beowulf and Leeta but, you have to ask yourself, why? Does it really add much? They can argue for one panel, and then we can move on. Let’s talk about plot for a little bit. So far in this chapter we’ve introduced our characters to a strange new setting, we’ve sent Leeta on a search for her father, and we’ve indicated that the Nazis have him. What we’re building to is (SPOILER) a scene where the Electric Team fights a bunch of Nazis. Man, I’ve been looking forward to that for months, I can’t wait. But patience is a virtue; we can’t just cut right to the big fight scene. Our heroes have to track down the Nazis. The thing is, I’m not a big Mystery reader. I’m not interested in writing the kind of story that is a carefully crafted puzzle, where the reader is attempting to piece together the clues before the hero does. I’m more a neat-concept-and-emotional-character-beat kind of guy. So I had this plan, about Leeta and her friends tracking down her dad, and then fighting Nazis, and I didn’t really care how they found the Nazis. But there are rules for genre fiction; the protagonists have to take an active role, there has to be suspense, and there has to be a plausible way for them to succeed, in investigation as well as fighting. 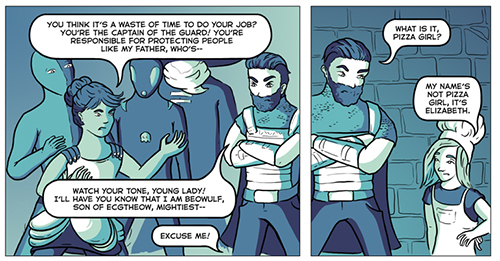 The time had come to write page 218, in which our heroes go to Beowulf about the Nazis. I had a vague idea that Beowulf would give them some kind of clue, and they could follow it, and maybe find an informant, or something? The problem was that seemed like it would take up too many pages, and at this point we’re already at page 20 out of (hopefully not much more than) 24. I needed a better idea. So, while I was driving them home from their grandparents’ house, I asked my kids what they thought should happen next. Abi is, of course, the co-writer of The Electric Team, so I often talk to her about the story. Jackson’s not as heavily involved, but he was there, and I didn’t want him to feel left out. Besides, Abi had already appeared in the comic, as Elizabeth the Pizza Girl, and I had previously told Jackson he could be in the comic, too, but he hadn’t yet appeared. Jackson again asked when he could be in it, as Sir Jackson the Brave, and I told him I didn’t know, but hey, how do you guys think the Electric Team should track down the Nazis in their hideout? To my great delight, the kids solved this narrative problem in a matter of moments. Their solution was that Elizabeth the Pizza Girl and Sir Jackson the Brave knew about a purple apple in the forest, and when you pulled the purple apple it opened a door in a tree, and that door led to the Nazis’ hideout. I liked this solution because a.) it was quick; b.) we’d already introduced Elizabeth into the story, and then she disappeared, so if she showed back up again it would look like we’d planned it that way; c.) it gave us a good reason to include Jackson in the story, as I had promised him. As I said earlier, I went through multiple drafts of page 218, until I figured out how to get the whole conversation with Beowulf and Elizabeth onto one page, so that on our next page we could cut to our heroes in the forest. 1. The panel needs to show all the heroes, to make it clear that Bart Hill, Octopus Jones, and Beowulf have tagged along with the Electric Team. 2. When the characters were inside the castle, the panel grids were fairly rigid, with a lot of smaller panels. That makes sense, since they were inside, but now that they’re going outside, a large, open, expansive panel creates a sense of openness and freedom, allowing the reader to, on some small level, experience the same sensation as the characters. 3. In a comic, space equals time. 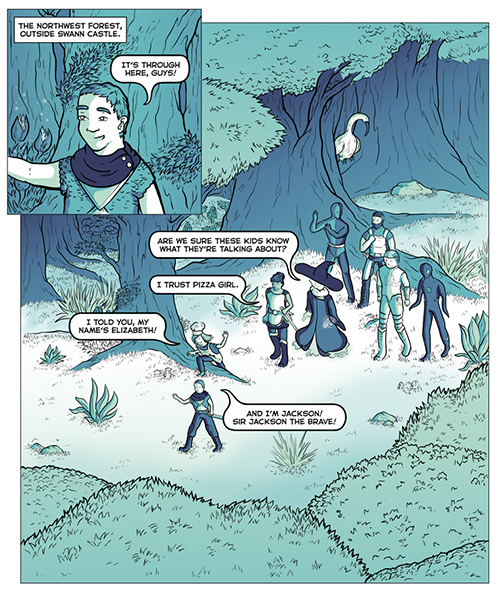 The heroes are walking through the forest, and we want to give a sense of them taking some time to travel, but we don’t have a lot of pages left. By including a large panel like this, that your eye can wander across, we create an impression of time spent traveling through the vast space of the forest, in a compact form. Okay, so I needed a big panel of our heroes in a forest, but I wanted the heroes to be following Elizabeth and Jackson, and Jackson has not yet been introduced in the comic. But I don’t want to waste the top row of panels on Elizabeth and Jackson introducing themselves; worse, since we’re jumping ahead in time, our heroes have already been following Jackson for awhile, so there’s no reason for him to introduce himself–he would’ve done that when they met. But he needs to mention his name, to satisfy my promise to my son. Eventually I decided to start the page with a smaller panel, introducing Jackson, overlapping the big forest panel. The overlapping means that I don’t have to waste the top row of the page introducing the kids. The key to making the page work, though, was the dialogue. Having Leeta refer to Elizabeth as “Pizza Girl” references Beowulf doing the same thing on the previous page, making it into a running gag, but more importantly it gives Elizabeth a chance to correct her, and use her real name, which gives Jackson a chance to say his name. So there we go, a plausible dialogue exchange that conveys the information I want conveyed, without reading like clunky exposition. Of course, Sam added a tremendous amount to the page. When I sketched out my crude layout, I had the heroes walking from left to right in panel 2. I pretty much always have everything go left to right, since that’s how we read in the Western world. But Sam flipped it, and made it work so much better. Notice how she leads your eye, the first panel pointing straight down to Zarko’s word balloon, and then the sequence of word balloons pulling you down to the left, directly to panel 3, specifically to the purple apple. It flows so well, and at the same time creates that sense of space and passing time that I had hoped for. Anyway, the bottom of the page . . . I figured we could do everything else we needed to with one panel to see the purple apple, one panel to pull it, and one panel for the door to swing open. And, lo and behold, Sam did it beautifully. In the script, I had them outside the door, gesturing at it. Sam moved the camera, so we’re inside the tree looking out, making it more visually interesting. Now our heroes have reached the Nazi lair, and the fight scene’s right around the corner. Hopefully, all these pieces will fit together so that when this chapter is collected into a comic the story will flow naturally, with none of the scenes feeling too short or too long, building to a satisfying climax. We’ll see. And this has been the longest blog post ever. If you made it this far, congratulations! You should win a prize.